Canadians are spending less time outdoors, despite evidence that reveals we’re happier when we spend time in nature. 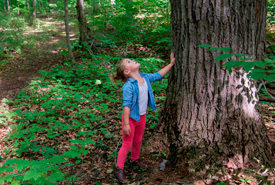 The Nature and Me survey, released by the Nature Conservancy of Canada (NCC), in partnership with Ipsos Public Affairs, reveals a growing disconnect between Canadians and nature. Canadians feel happier, healthier and more productive when they are connected to nature. Yet, 74 per cent say that it is simply easier to spend time indoors and 66 per cent say they spend less time in nature today than in their youth. The survey was conducted as part of NCC’s announcement of our Landmark Campaign — the largest private land conservation campaign in Canadian history. This $750-million campaign will double the land and water conserved by NCC to more than 6 million acres. Canadian forests, wetlands, grasslands, freshwater and coastline habitats are all declining at a rapid rate. In fact, habitat loss is the leading threat to Canada’s wildlife, especially our most endangered species. The Landmark Campaign is building momentum, having already raised $551 million and completed 400 of 500 projects. These projects are restoring rare habitats, supporting species at risk and improving the quality of our air and water. According to John Lounds, NCC’s president and CEO, we need to work together to protect our landscapes to enjoy now and into the future. To inspire Canadians to get outdoors, NCC has also curated a pop-up art exhibit called Nature and Me. The photography exhibit features a collection of intimate images and reflections provided by notable Canadians, such as Jim Cuddy, Edward Burtynsky, Cheryl Hickey, Rick Mercer, Clara Hughes and Adam van Koeverden, among others. These Canadians are sharing their stories to highlight the importance of nature as an inspiration in their lives. The exhibit runs at The Richmond in Toronto for one day only — Thursday, September 27 — from 2 pm to 8 pm. It will then travel the country this fall as part of NCC‘s NatureTalks speakers’ series, sponsored by TD Bank Group. The time to protect nature is now. According to our survey, more than 80 per cent of Canadians worry that accessible natural areas will not be there for future generations to enjoy. These areas are essential for our physical and mental health and for the health of the planet. Join NCC in protecting these Canadian landscapes, and get inspired to explore your relationship with nature. Mark Rittinger is thrilled to be serving as NCC's vice-president, development and marketing. Read more about Mark Rittinger.